This confidential and private communication tool just for shopowners is the best way to ask and answer questions about every area of your business. Members discuss the nuts and bolts of our industry and best practices, share ideas, and offer support to colleagues around the world. They consistently rave that this is one of their favorite and most valuable benefits of belonging to the FabShop Retailers’ Association. Members can to get connected with other FabShop Members on the private Facebook group by sending Laurie Harsh a friend request. *New Shopowners: Your shop must be open and retailing to the public to be connected to and participate in the online forum or chat. As a member, you are eligible for a complimentary pre-scheduled 30-minute telephone consultation with FabShop Founder and Retail Strategist, Laurie Harsh. You can use this time to get problem-solving advice on a topic of your choice from an experienced fabric retailer. This direct and personal access is a great value, and is worth the membership price alone! Additional paid consulting services are always available to Members as your business grows and changes. FabShop members receive consumer requests for fabric via email from fabsearch.net. Members who pledge to provide superior service, expert advice, and quality products are eligible for a complimentary listing on the shop local campaign website, fabricshoppersunite.com. The FabShop team researches monthly promotional holidays and ideas, and then compiles them into the promotional calendar. Use these calendars as a springboard for planning themed events, demo’s, and classes. Create memorable promotions and social media posts with FabShop original artwork created exclusively for members! Fun and festive cards are ready for you to customize with your shop information and mail out to capture your customers’ attention and bring them in the door. 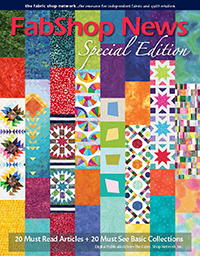 FabShop members have access to free downloadable quilt patterns in the members-only-area to use as needed! Offer as free download incentive, create kits, or use however fits your needs. U.S. and Canadian members can take advantage of exclusive discounts and save on inbound and outbound shipping costs. “The FabShop UPS Program saved us $1500.00 in shipping costs.” – Creations, Kerrville, TX. Planning to attend Quilt Market in the Spring or Fall? Use FabShop’s discounted Block of Rooms for your hotel stay! 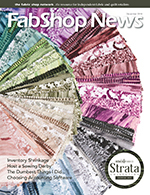 Your membership includes a complimentary subscription to the industries’ #1 resource, FabShop News Trade Magazine. Members tell us they read our bimonthly magazine cover-to-cover for its timely in-depth business articles, cutting edge industry and retailing trends, innovative strategies for success and new product features from key suppliers.  They keep FabShop News for years as a valued business resource.